The New Nashville City Tour was specifically designed to showcase Nashville's best features in only one hour on an open-air double-decker bus. This exciting tour of Nashville highlights over 100 points of interest and is led by a fun, informative local driver/guide. Here, you can see the best of Music City in just one hour. Experience Music City in just one hour on this new Nashville City Tour. From the comfort of an open-air double-decker bus, you will see over 100 points of interest throughout the city from a fun, local guide. This must-do tour is great for guests on a short visit to Nashville offering four different times to choose from. 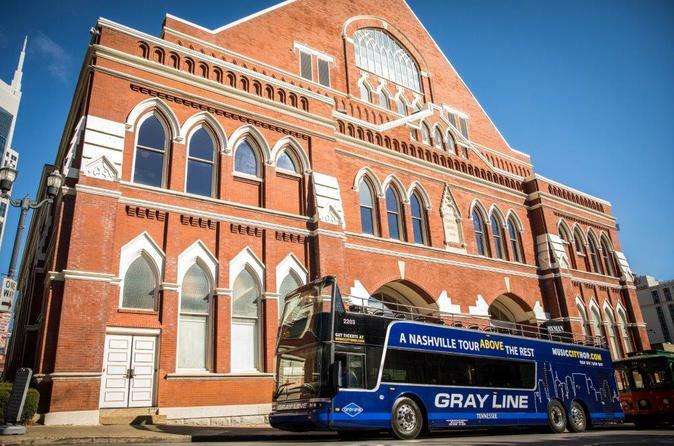 Some of the sights you will see during this hour long tour include the Ryman Auditorium, Nissan Stadium on Titans Way, the Country Music Hall of Fame, Music City Center, the State Capital, Parthenon at Centennial Park, Vanderbilt University, Riverfront Train Station, and Historic Lower Broadway.